Be Playful in the classroom! 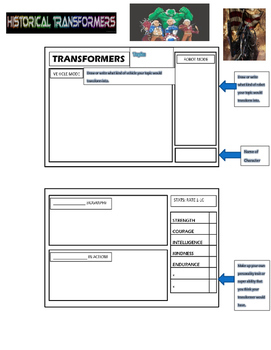 "transforms" into an automobile and robot. 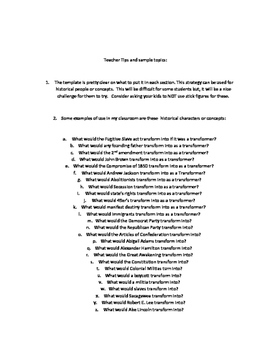 A student template with specific directions are included. An A-Z list of sample historical ideas is included. • Please go to your My Purchases page (you may need to login). Beside each purchase you'll see a Provide Feedback button. Simply click it and you will be taken to a page where you can give a quick rating and leave a short comment for the product. Each time you give feedback, TPT gives you feedback credits that you use to lower the cost of your future purchases. I value your feedback. It will help me determine which products are most valuable for your classroom so I can create more for you.